Kenvo Technology brings you the very best in replacing regular air with nitrogen. Kenvo has developed a four-tire valve system to enable the user to service all four tires at once. The machine only needs shop air, no electrical power. Other machines make the user fill and deflate the tires multiple times to achieve 95% nitrogen in the tires. 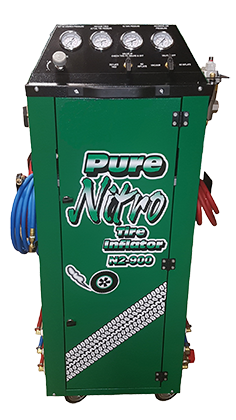 The Pure Nitro Tires Inflator applies a slight vacuum to evacuate all the air before filling the tires with nitrogen, only needing to inflate them once. The end result is a much faster service with 95-97% nitrogen in the tires.